Mid-19th century and "Colonial" reproductions: 2. Some modern, some vintage. Girls' wear 4: flowergirl dresses and dressups. Girls' wear 5; flowergirl dresses and dressups. Menswear 5: kilts for sale , alphabetical listing. Menswear 9: clan crest keyrings. 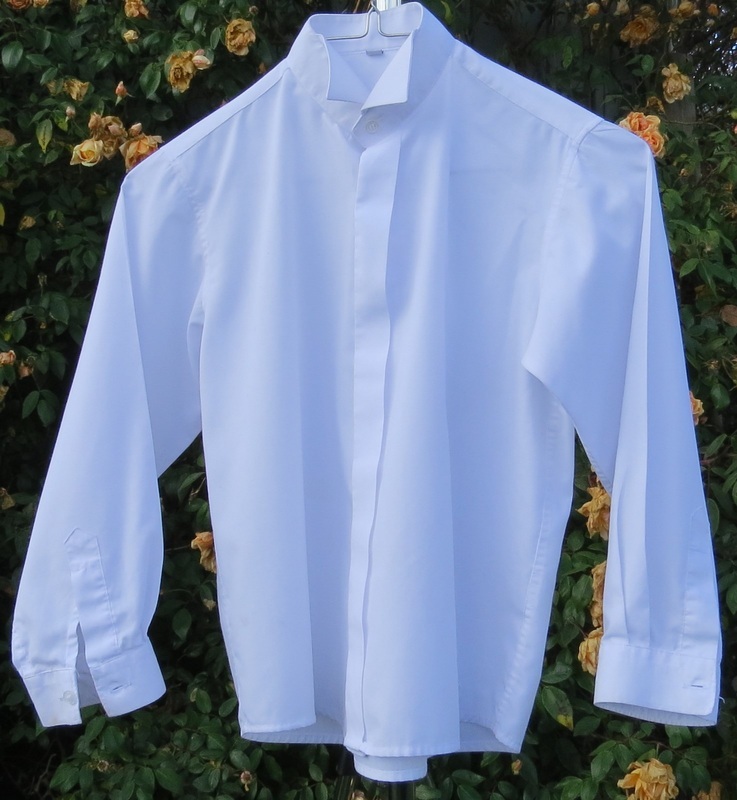 Bs1 Victorian-style wing collar shirt, to wear with bow tie and kilt. Recent. Two available. Bs1a for age about 6. Bs1b, for age about 8. Others can be supplied if needed. Also available in men's sizes (Jsc7). Bs2 Jacobite or ghillie shirt. Scottish or pirate wear. Four available. Bs2a, about 6 -12 months' size. Bs2b, toddler size. 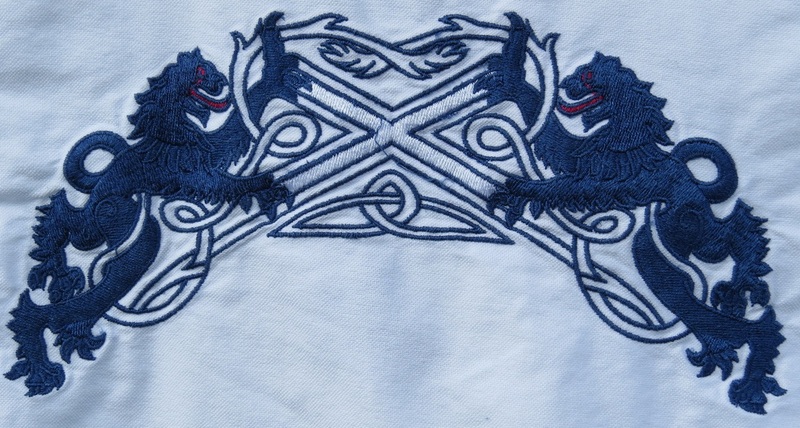 Bs2c, for age 8-10, with Scottish lions and saltire on back. Bs2d, new, for age about 13. Also available in men's sizes in white or green. Bs3. 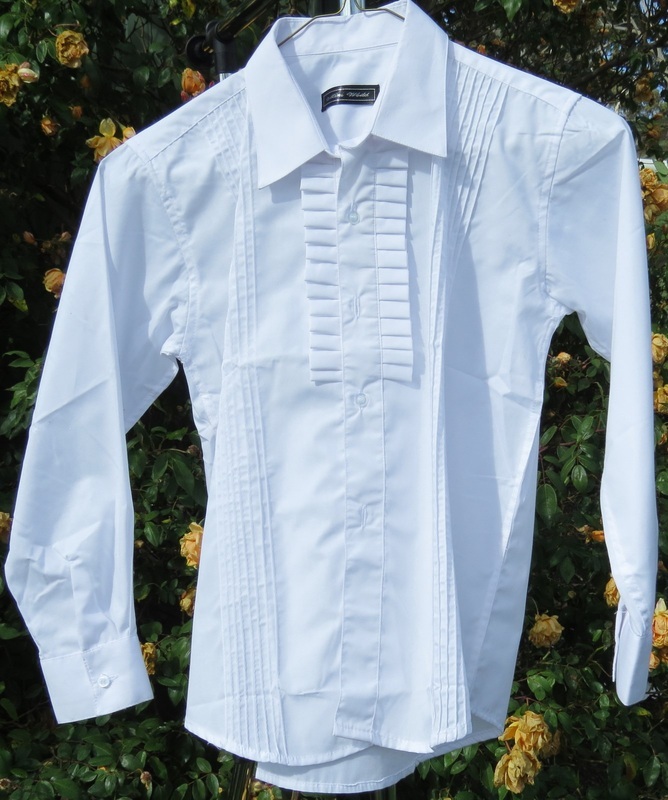 New equestrian (horse-show) shirt. two available. Bs3a, for age about 10. Bs3b, for age about 12. Purchase $20. Bs4. Late Victorian, unisex. 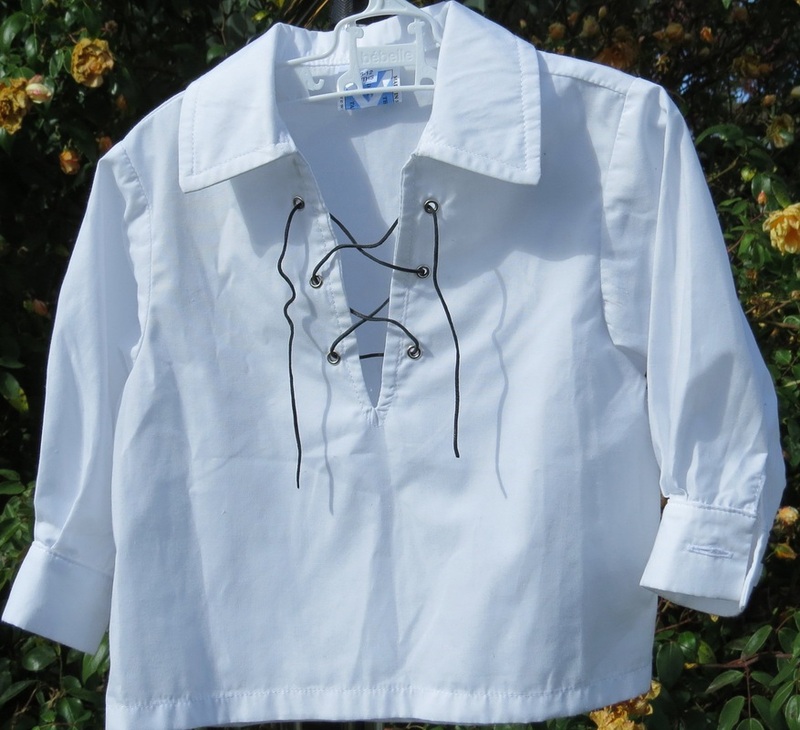 We have four similar cotton or linen shirts, most with ruffled collar and cuffs, for ages about 3 to 6. Would have been worn loose. Rental $15 each. 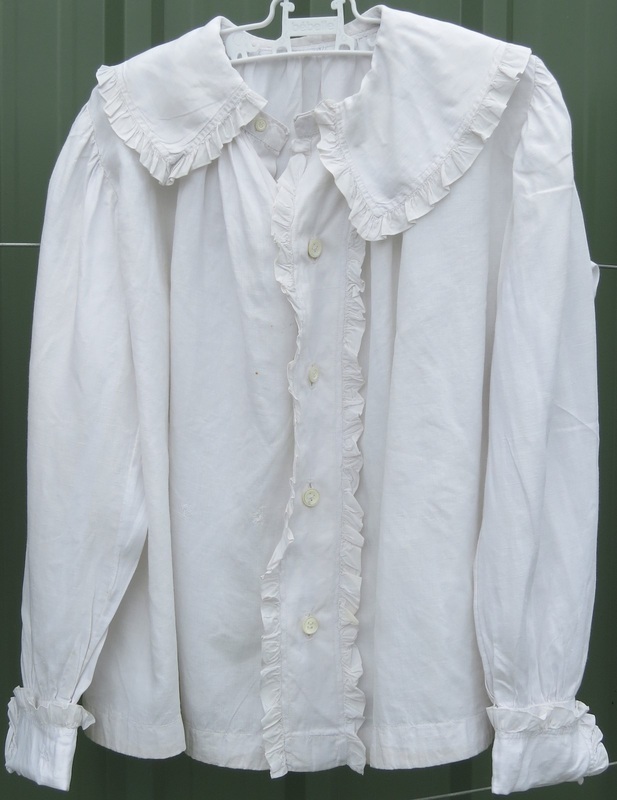 Bs5 Victorian /Edwardian - Little Lord Fauntleroy! 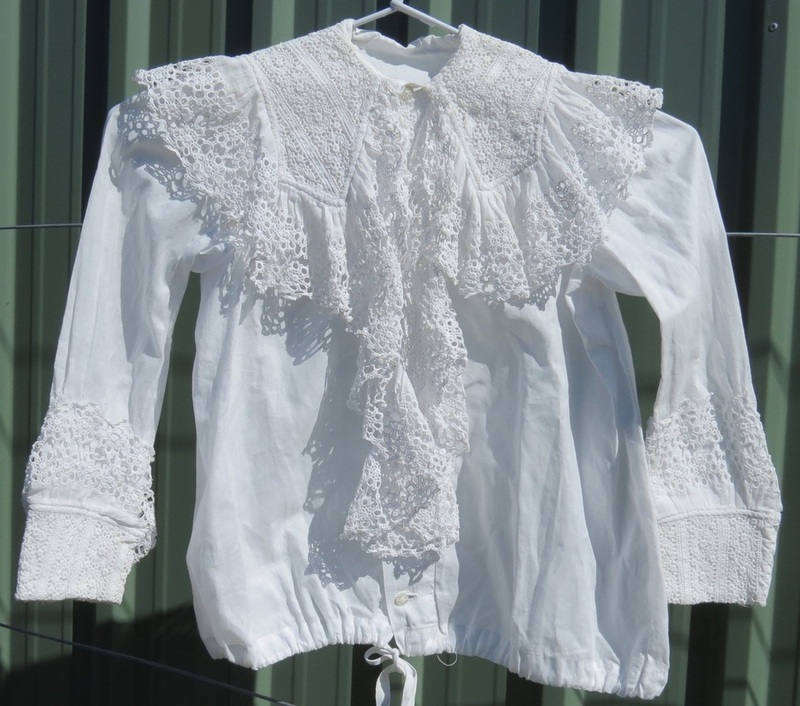 Lacy sailor collar at back. Chest 74cm, meant to be worn loose; drawstring waist; length shoulder to hem 42cm. Usually worn with a velvet knickerbocker suit, eg B2. Rental $20, purchase $65.